An end-to-end communications system is an innovative approach to communications. The premise behind such a system is that it provides a business with one seamless service to meet all of their communications needs. For example, it allows a customer to make phone calls (customers can make calls to ten-digit numbers, including 911) via the Internet as well as access programs like Skype, Microsoft Office, instant messaging, etc. via the company’s own cloud. Significant Savings. An end-to-end communications system allows businesses to save up to 75% on their communications costs. The ThinkTel service, in particular, does not charge any additional licensing charges: you simply pay for the services you need (Skype, Microsoft, etc.) but with the added benefit of having the ability to make phone calls via the Internet (VoIP). Since it is hosted on the cloud, you do not have to pay for costly servers and other expensive infrastructure. Highly Reliable. ThinkTel provides a high quality and reliable dial tone, even when you are unable to access the Internet. Your business will no longer be weighed down by problematic servers and their technical issues. Easily Scalable. An end-to-end communications system allows you to grow (or downsize) your business depending on your particular needs, without the need for costly infrastructure and time investment. Since you only pay for the services you need, an end-to-end communications system is a very flexible service, allowing you to add additional functionalities depending on the unique needs of your business. Convenience and Increased Productivity. An end-to-end communication system allows people to connect with others from anywhere on any device. Ultimately, this system makes communication convenient, which in turn increases your productivity. Better Security. You will feel secure knowing that all of your data is housed in one private cloud in Canada. The ThinkTel solution also comes with plug-and-play disaster recovery. In other words, you will no longer have to worry about how to continue functioning as a business in the event of weather problems. This also saves additional money when it comes to IT and loss of revenue due to downtime. 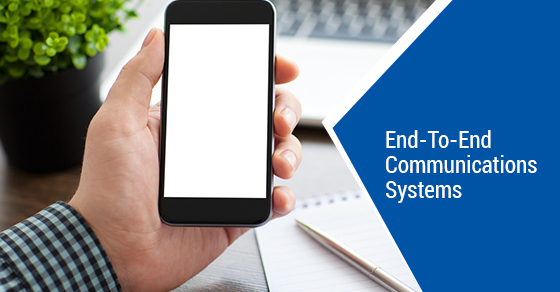 If you are interested in an end-to-end communications system, contact our team of professionals at ThinkTel today. We have become the IP voice provider of Fortune 100s, government agencies and public institutions – we will find the service that suits your unique needs.